Kuzhambu is the one of the main side dish of the Southern india especially tamilnadu. 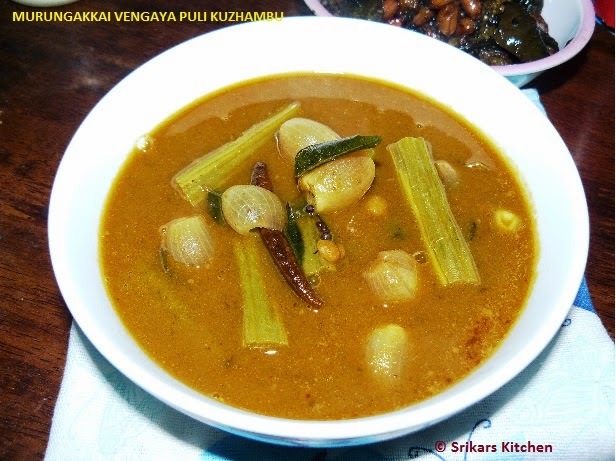 This is the same procedure of vathal kuzhambu but adding veggie to it.The best Combination of this kuzhambu is Beans poriyal, okra Curry, Potato curry or Brinjal curry with papad. Heat oil in a pan, add mustard seed,channa dal, fenugreek seed & allow to temper. Add red chillies, curry leaves,shallots & saute. Add sambar powder,salt & allow to saute until like raw flavour extracts . Add chopped drumstick & saute.Add tamarind water & allow to boil. Once vegetable is done & serve hot with plain rice.